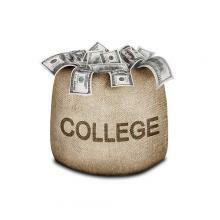 Most scholarships go unclaimed because the criteria are too strict. Did you know you could get a college scholarship for being tall? Or if you can make an amazing peanut butter sandwich? There's even a $10,000 prize for a high school couple that makes a pair of unforgettable prom outfits with duct tape. "I think particularly for scholarship programs that are less well-known, they exist and they're just waiting for somebody to apply," said Terri Taylor, an advisor with Education Counsel, a Washington, D.C.-based consulting firm. "So I think going out of your way to look for some of those hidden jewels -- particularly if you feel you may be less competitive for some of the scholarships that maybe are better known," she said. As costs for college continue to rise, so is student debt. Students graduated this year with an average of over $37,000 in debt -- a six percent increase over last year, according to Student Loan Hero. So more students are looking for different ways to help pay for school. Most scholarships go unclaimed because the criteria are too strict. Taylor says that's because some scholarships were set up decades ago. These are often smaller awards, like $2,000 or less. But it's easier to get the smaller scholarships because fewer people apply, said David Levy, editor at Edvisors, a group that helps students and parents figure out college costs. "One of the things we always encourage students to do, is to make sure that they apply for as many scholarships as possible -- but only apply for those for which they're eligible,” he said. He suggested that students start looking for scholarships before their senior year, and to pay close attention to the eligibility criteria before applying. And triple check the application before submitting. Failure to follow directions. Students should pay attention to number of recommendations requested, and be careful to not omit required information. Check with high school counselor. Check bulletin board for local scholarships. Look in the library’s jobs and careers section. Corporations often advertise scholarships at the bottom of coupons. “Take a look in the Sunday newspaper,” Levy said. Take some initiative. “Nobody’s gonna come knocking on the student’s door and say: here’s a scholarship." Prioritize applications by deadline date and expected value of the scholarship. Set up a calendar. Create an accomplishments resume. There's also need-based financial aid, called the Pell Grant. This is federal money that doesn't have to be repaid. Connecticut students missed out on over $20 million in federal aid money in 2014 -- that's because either students didn't apply for financial aid, or messed up during the application process. Nationwide, NerdWallet estimated that $2.7 billion in Pell Grant money went unused in 2014. Studies show that scholarship winners are more likely to graduate, and students who graduate college without debt are more likely to go to graduate school. What Can We Do About Student Debt in Connecticut? The federal reserve has calculated the amount of American student loan debt is over $1 trillion, greater than car loan and credit card debt. Lawmakers are trying to provide relief for students. As college student loan debt continues to climb nationally, lawmakers in Massachusetts are proposing some ways to help. A subcommittee of the legislature’s Joint Committee on Higher Education approved a report this week that contains nine recommendations including trying to decrease the time it takes to earn a college degree, increase state aid, and require all Massachusetts high school students to take a financial literacy course.